If you're wondering if every article in The Toronto Star makes it online, the answer is no. 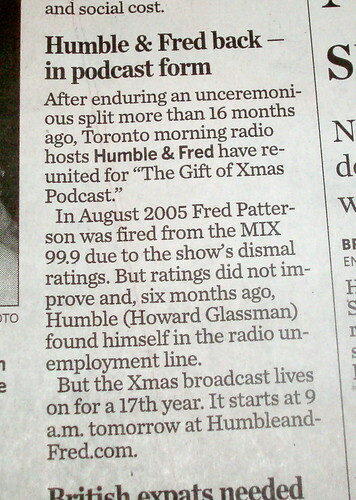 Today, for instance, there's a quick SPOTLIGHT mention of the 17th Annual Humble and Fred Christmas Podcast on page A31, but it didn't find its way to thestar.com. Here's a pic of the write up. Much thanks to Vinay Menon who sat in front of Steve and I during Conan O'Brien's show at the Elgin Theatre back in February 2004.